Methane is the second most damaging greenhouse gas produced by human activity. Though methane’s lifetime in the atmosphere is shorter than that of carbon dioxide, it is more efficient at trapping radiation. Methane has 25 times greater impact on climate change than CO2 over a 100 year period. An economical and sustainable technology to enable methane conversion to value added products will help harness methane for productive use. The proprietary platform of the String Integrated Methane Platform project exploits advances in synthetic biology, fermentation technology, chemistry and process engineering. One of the critical components of this platform is the gas conversion technology that this project has developed, with its first product to market being a protein, String Pro, made from methane. Conversion of methane to protein is a process that takes place naturally in lakes and ponds. Using advances in biology and engineering, this conversion has been industrialised. It can be leveraged for the manufacture of chemicals, food and feed ingredients from methane. Biological conversion of methane can occur at ambient temperature and pressure and has advantages such as no risk of catalyst poisoning, low operating costs and higher specificity. 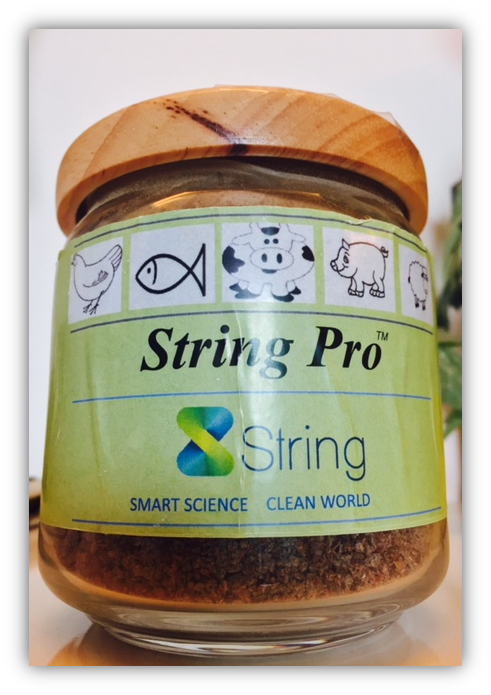 The technology behind String Pro provides a biological route for conversion of methane to value added products and, as a second step, allows for working with small to medium volumes of natural gas. The project scope can be further widened when adapted for other geographies as well as alternate sources of methane. Converting methane into protein creates a sustainable protein source that is cost effective and can address the growing worldwide protein demand by using a vented or flared resource as the input carbon. The project is currently being validated at pilot scale and is seeking finance, manufacturing capacity, and land to scale the technology to commercial production.